Katie McCroskey is a Privileged Account Management SME and currently leads the E-Learning and Knowledge Management team at Thycotic. Katie's team uses an effective combination of leading edge E-Learning solutions and in-person or video conferencing based training to reach a large, technical and geographically diverse audience. Katie revolutionized Thycotic's on-boarding process and helped Thycotic grow at a very rapid pace. 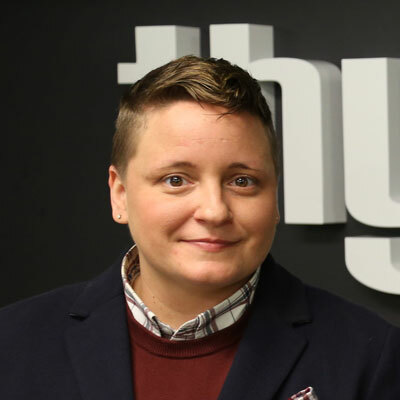 Katie has significant experience in the cyber-security industry, working at Thycotic for nine years, she has been successful in several influential positions at Thycotic Software including business development, marketing, and channel management/development. Katie worked in International Channel Development for seven years, culminating in a nomination by the US Commercial Services for the President's Export Award and won for successfully demonstrating five consecutive years of exporting sales growth (April 2016). Because of this expertise she has participated in numerous interviews with various organizations on a variety of topics. A few examples include: a panel discussion with the Washington Post Live on "Exporting Growth (Nov 2012), an "Export Like a Boss" podcast (Sept 2016), and an interview on Women in Technology (Feb 2017). During free time, Katie enjoys taking her dog Harper to the park and spending time with family and friends. I am responsible for partner training globally at Thycotic! My role includes everything from creating technical or sales content and conducting training webinars; designing and building technical, on-demand E-Learning training courses; and customized onsite training session for partners and partners customers. I help empower partners to understand our products, market position and selling strategies. Another part of my role at Thycotic is to provide technical product demos to teams of channel partner Sales Engineers and Security Consultants to educate and empower technical people, key influencers and audience to connect with in the channel. Education & Empowerment! I am focused on working with channel partners to educate them on Thycotic products, the cyber-security industry and how to successfully engage Thycotic. I continue to conduct training sessions on a variety of topics keeping partners informed on updates and innovations. I also manage our E-Learning Program and this technology-based training strategy has proven to be very successful. I am dedicated to keeping this system up to date with the latest on our rapidly progressing products and industry. Globally, we've seen a surge of partners participate - leading to better customer conversations - leading to more sales! Nothing recent.. but In April 2016, I received the honor of being nominated and winning the Presidents E Award for Thycotic successfully demonstrating growth in export sales for five consecutive years. This award was created by Executive Order of the President to give recognition to persons, firms, or organizations which contribute significantly in the effort to increase United States exports. This award was presented to myself and our CEO by Penny Pritzker, the US Secretary of Commerce on May 18th 2016. After the recent Olympics, I've become an admirer of Lindsey Vonn. Lindsey is a strong, driven women, leading in her industry! After Lindsey won the gold in Vancouver 2010 she was on top - everyone expected her to win big in 2014 Sochi, but she was hurt and did not complete. Over the years Lindsey experienced a lot of work-related injuries and setbacks but came back strong this year to win the Bronze in S. Korea. I think she's a leader on her US Ski team and a great example of what a strong, talented, driven woman can accomplish. Know your worth and learn the tech NOW! Women bring a lot to a tech company - different perspectives and skill sets. Tech companies with more women are more successful! And it's a hot industry - good paying jobs with lots of diversity in disciplines and opportunity. Don't allow yourself to be intimidated by a room full of men! It is very challenging to walk into a room of ALL men knowing they are going to drill you with tech questions until you prove yourself - but this is common. All you can do is come prepared and constantly improve. Building my expertise in cyber-security and possibly even becoming a CISSP. Cyber-security is very interesting for me and a great industry, always changing and rapidly growing. Liars & Outliers by Bruce Schneier. Bruce is a cyber guy that talks cyber - but doesn't really talk cyber. He uses a lot of science, analogies, and stories in this book and all his books. This Liars & Outliers is about trust, from all different aspects - really good read!